Is 'binge streaming' the future of scripted TV watching? The second season of Netflix original series House of Cards drew a staggering number of viewers in its opening weekend, and people weren’t stopping at just one episode. According to data from Procera Networks, a broadband technology firm, as of 5:30 p.m. on day one, 16% of Netflix subscribers at one particular Internet service supplied by an unspecified U.S. cable operator had watched the first two episodes. That was eight times the percentage of viewers who watched the first episode of the first season during the entire opening weekend. More than 2% of viewers got through the entire second season during its opening weekend, with some finishing all 13 episodes on day one, compared with only 2% that watched the first season’s first episode during that opening weekend on a similar-sized network last year. The average viewer watched four episodes of the second season this weekend, Procera said. Procera does not disclose information on individual clients. A survey conducted online by Harris Interactive on behalf of Netflix last year among nearly 1,500 TV streamers (online U.S. adults who stream TV shows at least once a week) found that binge watching is a widespread behavior among this group, with 61% taking part in the behavior regularly. A majority of respondents defined binge watching as watching between two to six episodes of the same TV show in one sitting, and nearly three quarters of TV streamers said they have positive feelings about binge streaming TV. “Both buzz and viewership of season two has significantly eclipsed season one over its first weekend,” Citigroup analysts Mark May and Kevin Allen said in a report. While 2-8% of Netflix traffic over the weekend was from House of Cards, the company still doesn’t spend a large portion of their content costs on original series such as House of Cards, Orange is the New Black, and Arrested Development. But analysts said they expect that number to increase in the future. “Original content is still below 10% of total content costs today, however, this percentage should grow over time,” Youssef Squali, analyst at Cantor Fitzgerald, said in a report. Netflix original series House of Cards is an American political drama set in present-day Washington, D.C. In July of last year, Netflix earned the first Primetime Emmy Award nominations for original online-only Web television. 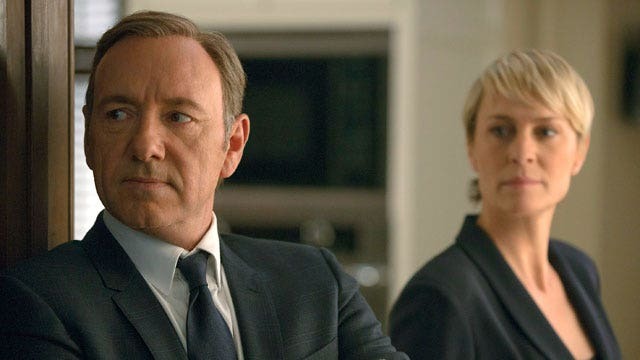 House of Cards received nine of Netflix&apos;s 14 total nominations. Netflix original series have now received more than 80 major award nominations and wins. Shares of Netflix hit an all-time high of $441.24 on Tuesday, the first day of trading after the show’s opening weekend. Netflix surged about 130% in the last year. Citi analysts said that according to Google Trends the popularity of House of Cards is up 76% year-over-year. Citi also argues that House of Cards has contributed to the popularity of Netflix, the Internet television network, noting that the popularity of Netflix is up 15% year-over-year. “House of Cards is commonly considered to be a key contributor to both subscriber acquisition and retention for Netflix in the U.S. and abroad,” the analysts noted. Not surprisingly, the political drama is most popular is Washington, D.C., according to Google Trends. Even President Barack Obama appears to be a fan. The day before the series aired, he tweeted: "Tomorrow: @HouseOfCards. No spoilers, please." Focus will now shift to the release of the second season of Orange is the New Black on June 6, another Netflix original series, which ended 2013 as the firm&apos;s most-watched original series.